Garlic is one of the oldest cultivated crops. It was fed to the builders of the Great Pyramid in Egypt in the belief that it gave them strength and endurance. I first learnt of the therapeutic effects of garlic 7 years ago while researching a paper, looking at foods that can prevent lifestyle related diseases. Prior to this I enjoyed the flavour of garlic but had no idea of the amazing anti-inflammatory properties it possessed. Garlic is a member of the lily family; alongside onions, leeks and shallots. There is evidence to support an inverse correlation between the consumption of garlic and the development of cardiovascular disease. Garlic has been found to reduce cholesterol, inhibit platelet aggregation, reduce blood pressure, and increase antioxidant status. 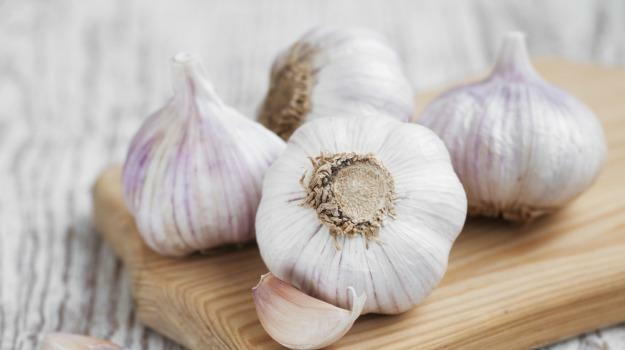 In addition to garlic’s impressive effects upon the cardiovascular system, numerous studies have demonstrated the anti-carcinogenic and anti-oxidant actions of garlic, as well as the beneficial effects of garlic upon the immune system. There is also a reasonable amount of evidence supporting the consumption of garlic in the prevention of certain cancers. Garlic was used as an antiseptic against gangrene in the First World War. The preparation of garlic is essential to the effectiveness of its active ingredients. To maximise the effectiveness of the anti-inflammatory properties, the garlic should be crushed and allowed it to sit for 15 minutes at room temperature before cooking. This process allows a series of enzymatic reactions which are essential to the formation of the healthy compounds that give garlic it’s beneficial properties. It is easy for one to get very excited about these incredible benefits of garlic being demonstrated in current studies. One downside is the concentration of garlic being used in many of the studies demonstrating its wonderful effects on lifestyle diseases such as cardiovascular disease and cancer. Some studies have described consumption as high as 12 cloves of garlic per day in their method. Although this may seem like an unattainable amount of garlic for anyone to consume a day I don’t think it should distract from the amazing evidence supporting the consumption of garlic and its incredible effects on maintaining good health. I like to think of the quote above and believe that to make sustainable changes to one’s diet and lifestyle-little and often is the best way forward. Perhaps introducing garlic to favourite meals in small doses and acclimatising the taste buds to the flavour. Parker-Pop, T. (2007). Unlocking the Benefits of Garlic . Available: https://well.blogs.nytimes.com/2007/10/15/unlocking-the-benefits-of-garlic/. Last accessed 21st Mar 2018. Rahman, K and Lowe, G. (2006). Garlic and Cardiovascular Disease: A Critical Review . The Journal of Nutrition. 136 (3), 736–740. Schäfe, G and Kaschula, C. (2014). The Immunomodulation and Anti-Inflammatory Effects of Garlic Organosulfur Compounds in Cancer Chemoprevention. Anticancer Agents Med Chem. 14 (2), 233–240.